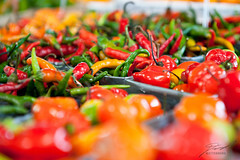 During a photowalk this fall I discovered a great location to shoot – Detroit Eastern Market. The photowalk was actually through the nearby Dequindre Cut, but we moved toward Eastern Market pretty quickly. I visited Eastern Market many times as a youngster, and a few times since, always with cash in hand to purchase fresh edibles (especially cheeses from R. Hirt Jr.), but never with a camera. This time, under the cover provided by a small group of photographers, I took the chance to shoot in a location I'd seen hundreds of times but never considered a subject. Now I was seeing great images calling to be captured. Many of those I'd never attempted before the amazing high ISO performance provided by my D700. That body and some fast lenses gave me the chance to pound out my three frame bracket sweeps with a few great results. If you're in the area and have the chance, certainly take the time to visit on a Saturday morning. 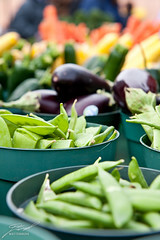 You're bound to come away with some interesting images, and very likely some good, fresh produce.